The NASA/ESA Hubble Space Telescope has found out the true nature of a dwarf galaxy that astronomers had for a long time identified as one of the youngest galaxies in the Universe. Astronomers using the NASA/ESA Hubble Space Telescope have made observations of the galaxy I Zwicky 18 which seem to indicate that it is in fact much older and much farther away than previously thought. Observations of I Zwicky 18 at the Palomar Observatory around 40 years ago seemed to show that it was one of the youngest galaxies in the nearby Universe. The studies suggested that the galaxy had erupted with star formation billions of years after its galactic neighbours, like our galaxy the Milky Way. Back then it was an important finding for astronomers, since this young galaxy was also nearby and could be studied in great detail; something that is not possible with observations made across great distances when the universe was much younger. But these new Hubble data have quashed that possibility. The telescope found fainter older red stars contained within the galaxy, suggesting its star formation started at least one billion years ago and possibly as much as 10 billion years ago. The galaxy, therefore, may have formed at the same time as most other galaxies. "Although the galaxy is not as youthful as was once believed, it is certainly developmentally challenged and unique in the nearby Universe," said astronomer Alessandra Aloisi from the European Space Agency/Space Telescope Science Institute, who led the new study. Spectroscopic observations with ground-based telescopes have shown that I Zwicky 18 is mostly composed of hydrogen and helium, the main ingredients created in the Big Bang. In other words the stars within it have not created the same amounts of heavier elements as seen in other galaxies nearby. Thus the galaxy's primordial makeup suggests that its rate of star formation has been much lower than that of other galaxies of similar age. The galaxy has been studied with most of NASA's telescopes, including the Spitzer Space Telescope, the Chandra X-ray Observatory, and the Far Ultraviolet Spectroscopic Explorer (FUSE). However, it remains an outstanding mystery why I Zwicky 18 formed so few stars in the past, and why it is forming so many new stars right now. The new Hubble data also suggest that I Zwicky 18 is 59 million light- years from Earth, almost 10 million light-years more distant than previously believed. On extragalactic standards this is still in our own backyard yet the galaxy's larger-than-expected distance may now explain why astronomers have had difficulty detecting older, fainter stars within the galaxy until now. 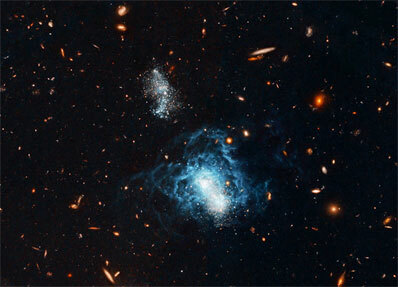 In fact, the faint old stars in I Zwicky 18 are almost at the limit of Hubble's sensitivity and resolution. Aloisi and her team discerned the new distance by observing blinking stellar distance-markers within I Zwicky 18. Massive stars, called Cepheid variables, pulse with a regular rhythm. The timing of their pulsations is directly related to their brightness. By comparing their actual brightness with their observed brightness, astronomers can precisely measure their distance. The team determined the observed brightness of three Cepheids and compared it to the actual brightness predicted by theoretical models specifically calculated for the low metal content of I Zwicky 18 in order to determine the galaxy's distance. The Cepheid distance was also validated through another distance indicator, specifically the observed brightness of the brightest red stars in a characteristic stellar evolutionary phase (the so-called "giant" phase). Cepheid variable stars have been studied for decades (especially by Hubble) and have been instrumental in the determination of the scale of our universe. This is the first time, however, that variable stars with so few heavy elements were found. This may provide unique new insights into the properties of variable stars, which is now a topic of ongoing study.